This entry was posted in Research Risk Communication on October 5, 2010 by Holly. I have since used this a couple of times in talks to illustrate the point that a lot of people design applications like this, but there is very little science upon which to base decisions about how to present results to users. Even if the developers manage to design for good usability (which, happily, more and more people are doing all the time), there doesn’t appear to be a lot of attention to the science of how subtle details can influence how users will interpret the data or information presented. I know that the number 41.9% is based on mountains of carefully-collected data, and so the precision is actually defensible from a scientific perspective, but what does that level of precision mean to a man using the application? Does 41.9% convey more or better information than 42%? 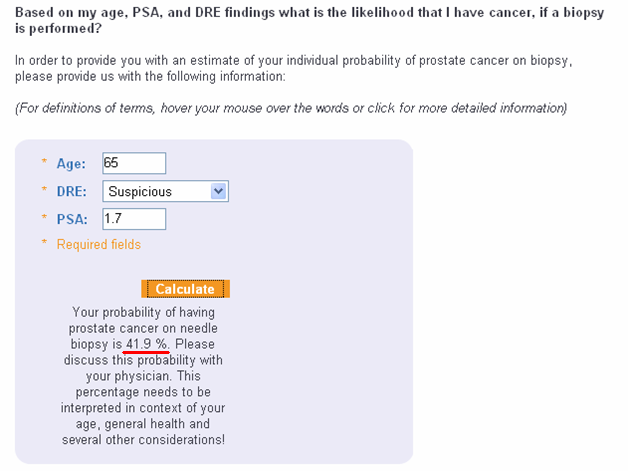 If he clicks around, and finds the screen that explains that the data upon which this estimate is based come from a series of nomograms in the Journal of Urology, and that the overall accuracy is 80%, is that meaningful? How is he supposed to use the 80% accuracy rating to interpret the 41.9% estimate? Does he understand what the estimate means? Does he even really want to know? And how does all of this depend on individual factors such as numeracy and decision-making preferences? I have been thinking about these questions for a while, and was finally able to run a study looking at a piece of this issue. I submitted the manuscript recently, so stay tuned for some answers. Update: The manuscript is out, and I also presented our findings at a conference recently.